July 2011 – Oh Remy! 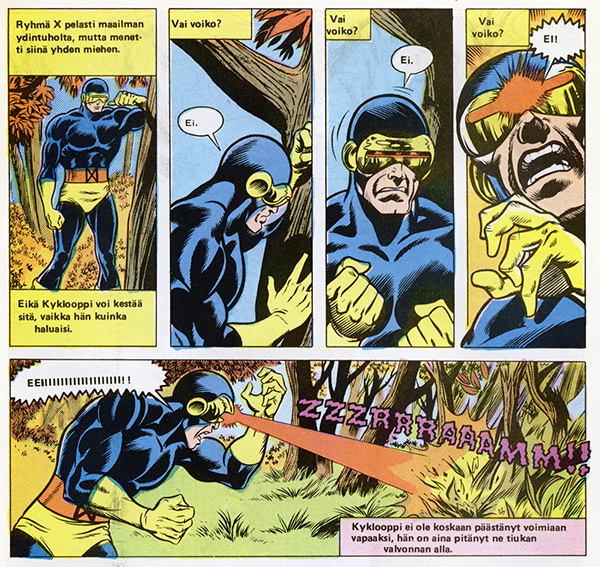 In last Ryhmä-X Wolverine‘s face promised a quick death for the Hellfire club and in Ryhmä-X 6/1985 he delivered. The X-Men are being held by the Hellfire club and Jean/Phoenix turned into the Black Queen by Jason Wyngarde/Mastermind. The only one to escape being captured in the last issue was Wolverine, who goes on a rampage downstairs in order to free his colleagues. Meanwhile Scott/Cyclops tries to free Jean from Wyngarde’s grasp by using the link Jean had formed between the two of them. He succeeds, but in an illusion created by Wyngarde he’s struck dead in front of Jean, who instead of being sucked into his illusion is awakened by the events breaking the last locks holding her Phoenix powers. She helps the X-Men free, who in turn take down the Hellfire club, having learned from their last unsuccesful battle with them. Unfortunately for everybody, Dark Phoenix is loose, she destroys Wyngarde by giving him all the information in the universe, thus overflowing his mind. The story ends just when the X-Men have stepped into their plane and are ready to return home when she suddenly reveals herself as the Dark Phoenix. Gulp! The second story is still about the birth of the new X-Men. 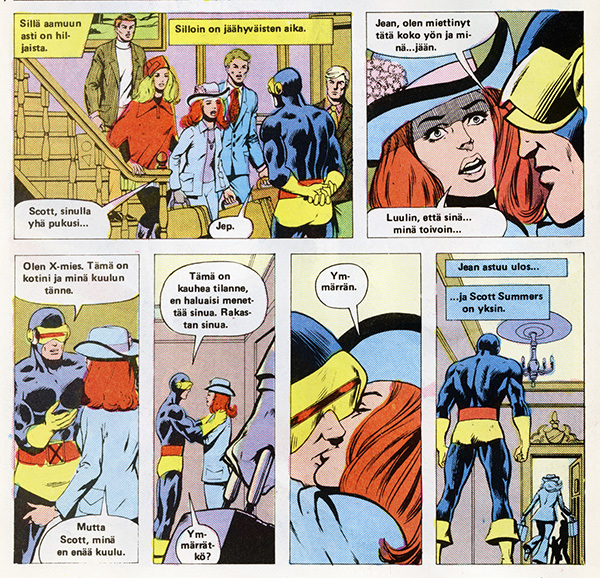 In Ryhmä-X 5/1985 Xavier had collected new mutants to the new X-Men, but already some are resigning from the group. Shiro leaving like a pro. 1) "Sunfire says his goodbyes to you idealists." 2) "And don't..." 3) "...ask my help again, X-Men. 4) "Because you'll get none." The first one to go is Shiro/Sunfire who joined the group just because Xavier asked him to. Shiro, apparently being one rude mutant, leaves the group with style. Just listen to this. Xavier says to the X-Men: “About the future…” Shiro intervenes: “Which definitely does not include Sunfire, professor.” Professor looks puzzled (not to mention my face): “But, Shiro, I don’t understand. You joined us.” Shiro, obviously remembering things a bit different than what was shown to us in last issue, replies: “I came here to offer my help, but only because of my obedience to the emperor, not for you. I don’t care for the X-Men the least bit. My country is the most important thing for me.” Xavier asks some of the other new members if they agree with Sunfire. The others decide to stay since it’s only been two days (!) since they joined the group. Shiro, the most fickle mutant ever (maybe it’s his superpower) bangs the door open and proclaims on his way out: “Sunfire says his goodbyes to you idealists. And don’t ask my help again, X-Men, because you’ll get none,” and he flies away. Good riddance with that attitude, says I. Next ones to leave are the members of the old X-Men. Funny thing is they obviously made the decision behind Scott’s back since he’s totally oblivious to their decision even though Jean is part of the group. Once again weird details on their very healthy relationship. Making a life-changing decision without telling your loved one… Yeah, that’s the best way to nurture any relationship. The following day Jean and the rest of the old group are leaving when they find Scott downstairs, still wearing his uniform. Scott: “Jean, I’ve been thinking about this the whole night and I’m… staying.” Jean: “I thought you… I hoped…” Scott: “I’m an X-man. This is my home and I belong here.” Jean: “But Scott, I don’t.” Scott: “This is a horrible situation. I don’t want to lose you. I love you. Do you understand?” Jean says: “I do”, kisses him and leaves, leaving him behind. Oh wow, that’s cold. Talk about true romance. From 2nd panel. 1) Scott: "Jean, I've been thinking about this the whole night and I'm... staying." 2) Jean: "I thought you... I hoped..." 3) Scott: "I'm an X-man. This is my home and I belong here." 4) Jean: "But Scott, I don't." 5) Scott: "This is a horrible situation. I don't want to lose you. I love you." "Do you understand?" 6) Jean: "I do" 7) "Jean steps outside..." "...and Scott Summers is alone." You know that nagging feeling? It’s actually the narrator. Nagging narrator at work. 1) "The X-Men saved the world, but lost one man doing it. / And Cyclops can't handle it, no matter how he tries." 2) "Or can he?" Scott: "No." 3) "Or can he?" Scott: "No." 4) "Or can he?" Scott: "NO!" 5) "NNOOOOOOOO!" Ryhmä-X 6/1986 was the reason I began collecting Ryhmä-X magazines. In good condition. Value today c. 5 €. My husband and I visited Norway to meet his newborn nephew. The trip began in true Marvel spirit when the first stop was at another collector’s home to buy some more comics. This gave me the idea to write about collecting comics, how much they cost, and where to get them. I got most of my magazines in my youth, subscribing to or buying the magazines as they came out. I think I got the idea to get full collections just a few years ago. Before that it was just getting those few missing issues from the late 1980s when I began reading Marvel comics. 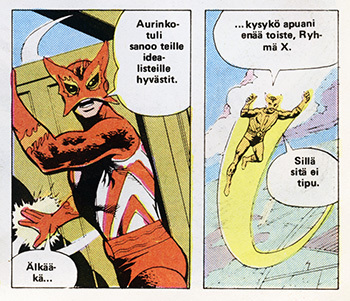 I think the idea to get the older issues came from one Ryhmä-X magazine I had bought in my youth. 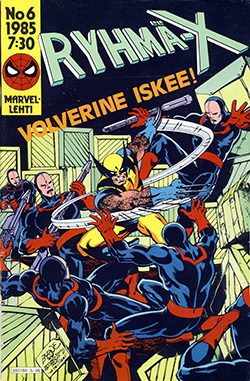 It was Ryhmä-X 6/1986 and I didn’t have any of the previous issues and the first issue after that must have been at least two or three years later. So that one magazine was alone with no context to place the story into. Then I got the idea to buy all the rest of the magazines and read the story of the X-Men from the start. And soon I decided to buy also the few missing Marvel magazines and special issues, too. This is from the collection of the collector I visited. Many thanks for letting me take photos! Presenting the collectors' worst nightmare. I picked up my missing Ryhmä-X magazines quite fast since they are generally very easy to find. If you don’t mind about the condition of the magazines that much just go browse through old book stores. Unfortunately most of them have stopped selling magazines and some of my old favourite places from my youth have gone out of business. One that’s still in business and sells comics is the Kampintorin antikvaarinen kirjakauppa. If you are picky about the condition of your magazines you should concentrate on the few specialists. The best one being Kulkukatin poika in Kallio, Helsinki. The prices are high, but the collection is huge and the magazines are well cared for not to mention the expertise of the owner. Besides occasionally they get the estates of deceased collectors with some spectacular finds. The other place to buy magazines from a store in Helsinki is Oranssi planeetta opposite of Paavalin kirkko. They have a smaller collection, but fairer prices and the magazines are usually in good condition. The best place to buy and sell your own magazines is Huuto.net, the auction website functioning in Finland. Quite many collectors and businesses sell their magazines via Huuto.net. I have had only good experiences in there since most of the sellers are collectors themselves. Sometimes the comics are so well packed, if a nuclear bomb would detonate they’d be the only thing to survive. But you should be wary since there are hoaxes among honest sellers. Then again the crooks usually concentrate on more expensive items than 2 € magazines. 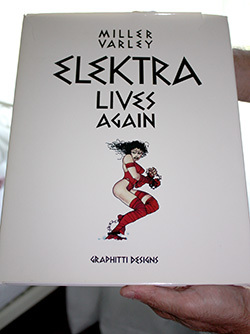 Another and in my opinion the best place to buy comics cheaply are book and comic fairs. All companies usually hoard large quantities of comics before a fair and put them on sale there. And the best part is some of the sellers are located so far from you, you couldn’t easily go through their collections at any other time. Highly recommended! I’ve found most of my magazines on the cheap this way. Also one more thing. If you are at the point where you are only missing a few comics here and there and manage to bid a magazine for yourself in Huuto.net, you should always send the seller also the list of your other missing magazines. Only very few times I haven’t managed to get any extras with my original purchase this way. And it’s always a good idea to contact your local old magazine store like Kulkukatin poika and let them know what you are looking for. It’s surprising how few people do this. For example I know many people are looking for Ryhmä-X 1/1984, the first issue, and it would seem I’m the first in line for that in few places. I’ve noticed some people find it unbelievable you’d pay 10 euro for a magazine that used to cost 7 Finnish markka (= c. 1,20 €) in the past. Well, you can forget what they used to cost straight away. Since I have bought most of my magazines fresh from the printers I have no idea what they cost today, but most of the magazines are worth 1-2 euro from what I’ve seen. So not much. But when it comes to older magazines published in the 1980s the prices get higher and the magazines more difficult to find. Ryhmä-X magazines from 1980s in good condition cost around 5 euro. You can find them easily for just 2 euro if you are patient and keep your eyes open. The first two years are different. 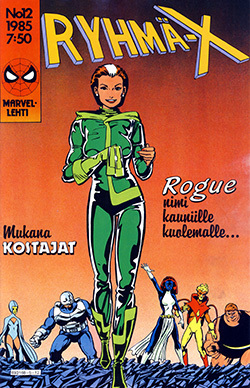 In 1985, the second year, there were 12 issues of Ryhmä-X and they now cost from 7-15 euro. In mint condition they can cost as much as 20 euro. I have bought most of mine at 7-10 euro. And at that price the magazines are clean and in good condition: read through, the pages have turned a bit yellowish, might have small tears on and some dirt stains on covers, but otherwise perfect. 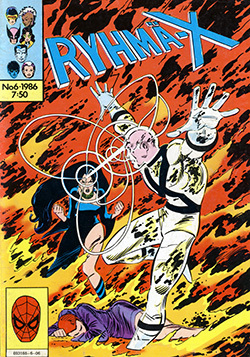 And then there is the first year of Ryhmä-X 1984 with 3 issues. The issues #2 and #3 are a bit of a mystery. You can get them as cheap as 20 euro, but you might end up paying as much as 40 euro, but that’s already too much in my opinion. In my opinion issues #2 and #3 should be around 25-30 euro in good condition. Those two issues are already hard to come by so I’d say it’s all about luck how much you have to pay for those. And then the first issue: Ryhmä-X 1/1984, definitely the most difficult issue to find. I’ve seen people asking as much as 100 euro for it, but you can get it for as low as 40 euro in good condition. 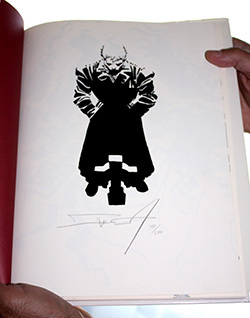 The highest price I’ve seen for the issue was 150 euro(! ), but that’s already ridiculous. Then again the magazine was definitely in mint condition. It was just like straight from a printer. It was so beautiful I was just lucky to have seen it. It was unbelievable. But in my collection it would have been just a waste of money since my magazines are for reading and that would be like a crime, because reading through a magazine will leave its mark on it and will lessen its value. So be warned. As for the fair price for a Ryhmä-X 1/1984, I would pay around 40 euro. Ryhmä-X 12/1985 in mint condition - 20 €. I’ve concentrated only on Ryhmä-X magazines and that’s because none of the other magazines cost as much. Pretty much all Marvel, Sarjakuvalehti, Mega-Marvel, Mega and Wolverine magazines cost those 1-2 euro per issue. I’ve noticed that issues with Fantastic Four and Punisher usually cost less than with other superheroes, since they are not that popular in Finland. Special issues are usually more expensive and harder to find hence their price varies greatly. For example the Wolverine and Kitty Pride special from 1987 can cost anything from 10-25 euro in good condition. I haven’t mentioned any Hämähäkkimies magazines and that’s because I haven’t collected them. But from what I have gathered the fan base in Finland for Spider Man is even larger than for X-Men hence making them more expensive. I’ve heard the first issue of Hämähäkkimies costs around 100-150 euro in good condition, but don’t take my word for it. And then there are those older Marvel magazines published in Finland like (*Vihreä mies) Hulk (*1981-4/1984-5), Kostajat (1975-6), Ihmeneloset (1982-84) and Ihmesarja (1967-70). I just bought Hulk 1-12/1985 for 25 euro. (Buying a whole year is often cheaper than buying single issues, but not always.) I have seen these magazines sell for as low as 2 euro to as high as 15 euro and issues in good condition are very hard to come by. Usually the best way to check out how much magazines cost is to go to Huuto.net and check out how much have the magazines cost there the last times. Of course, the rarer the magazine, the most likely you are to get a wanton value for the magazine. It depends solely on how many people noticed the magazine, bid for it and how high the beginning price was for the bids. Another way is to go to the Kvaak.fi forum and ask there. When I was offered that 150 euro Ryhmä-X 1/1984 I had to go there and take a reality check with them. Basically I asked them if there were anybody who’d pay that much for the magazine. None of them would and therefore I was able to let the magazine go. Kostajat 1/2011, brand new. 5,50 €. Future collectors' item? But really, in the end it’s all about how much the magazine is worth to you. For example I could have paid that 150 euro for that first Ryhmä-X and eat less the following month, but since I already have a photographed copy of it I’m not in such desperate need to have it immediatelly. I can wait for a better deal. Then again, in these last few years I had never come across Ryhmä-X 12/1985 and it was the other magazine still missing from my collection of Ryhmä-X. At the same time I was offered that first issue this one also turned up for 20 euro. I think a fair price for a copy in good condition would be 10 euro, but I had never seen it and was already beginning to wonder if it had ever even been published. So getting a chance to buy it, I did. Paying 10 euro “extra” for it was definitely worth it instead of waiting another five years for it. Besides, the magazine was in mint condition. I almost hate the fact I’ll have to read it. Oh, and one last thing. If you happened to buy the Kostajat magazine on June 2011 (Egmont is publishing three issues of Kostajat this summer), don’t throw it away after you’re done with it. 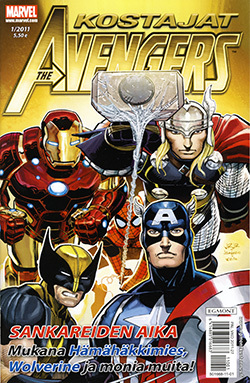 It was not available for subscription, the publisher failed to advertise the magazine and it was on sale only for three weeks, causing many Marvel fans to miss the magazine completely hence making it already a collector’s item.